Take lessons, watch videos and play games! Have some fun in Quaver's World! Record, share, and download your own composition! Create your own musical island and share it! Chuck, Ramona and Zeppelin will teach you everything you need to know about each musical genre! Join Violet as she embarks on an instrument safari, collecting all the instruments of the orchestra! 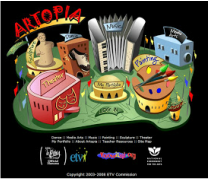 Learn all about music, dance, theater and art! Explore jazz through a virtual mixer where you can listen and observe the elements of jazz. There's also a jazz timeline and world map! Learn all about the musical families of the orchestra with Leo! Learn all about the instruments of the orchestra with quincy! 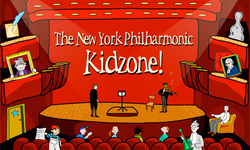 Learn all about composers and the orchestra and play some fun music games! Help Quincy, Leo and friends on their orchestra ocean treasure hunt! Martha Speaks - Make the Band! Build your own band in a virtual recording studio! 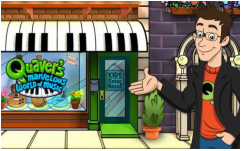 Robbie and Curly have some musical mysteries to solve ﻿and they need your help! Be the director, choreographer, lighting designer and more of your very own Opera: Hansel & Gretel! Dive deep and discover fun facts about instruments, music and composers! Explore how they are related and linked together! Learn about classical music and composers, and play fun games to learn more about music and rhythm!